I adore pasta salads, especially in the summertime. They are so versatile, and can be eaten as a main dish, or as a side. And they are usually pretty easy to put together, and most travel well for a picnic at the beach, or a barbeque at someone's house. 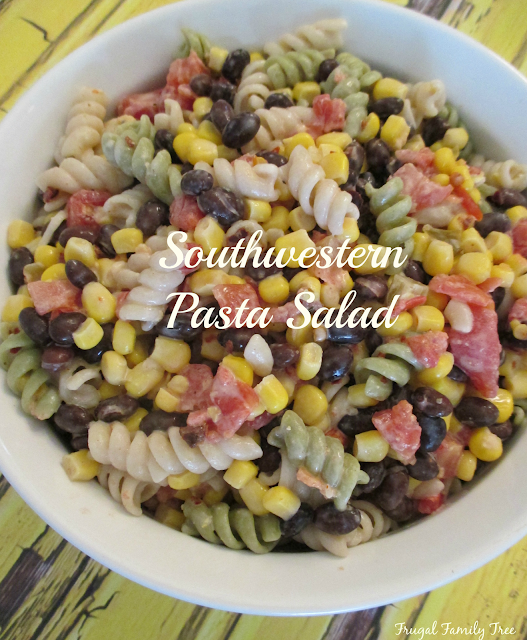 This Southwestern Pasta Salad has a nice spicy kick to it, and you can heat it up even more with the addition of some red pepper flakes. The black beans and tomatoes give it a healthy boost. I've been trying to incorporate black beans into my recipes lately because of their great nutritional value. I do actually like the taste of them too, so I've included them in tacos, soups, and green salads. But back to this yummy pasta salad. My family and I ate it for dinner out on the deck with steaks that my-son-in-law grilled. It was perfect with them, and there was enough left over for my lunch the next day. It will make about six portions for a side dish. In a large bowl, mix together the mayonnaise, sour cream, lime juice, taco seasoning, and black pepper. Add the cooled pasta, black beans, tomatoes, and corn. Mix together well, making sure everything is incorporated. Cover and place in the refrigerator for at least two hours, so that the flavors can blend together nicely. Makes about 6 side dish servings.